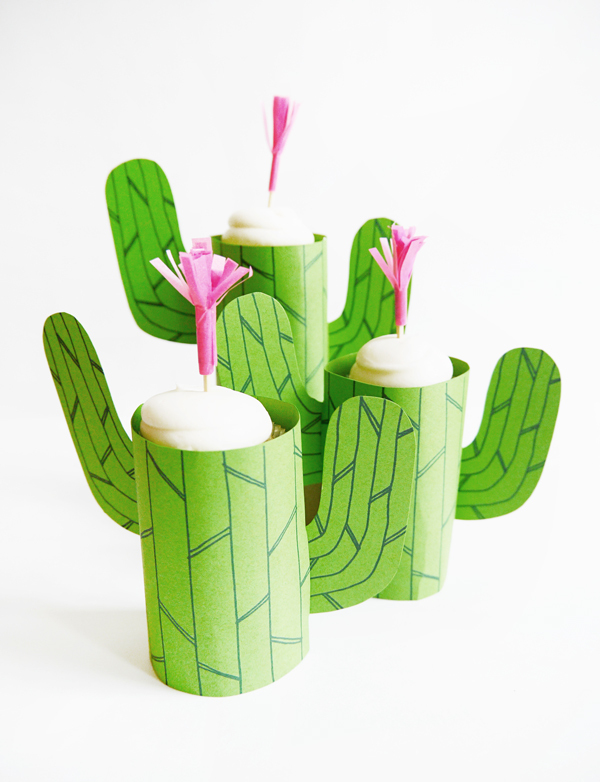 Even though the cactus trend has been around for a while, I couldn’t resist one more succulent-themed craft. Whether you’re having a desert-themed party or you just want to dress up your cupcakes then this is the the perfect thing to make. 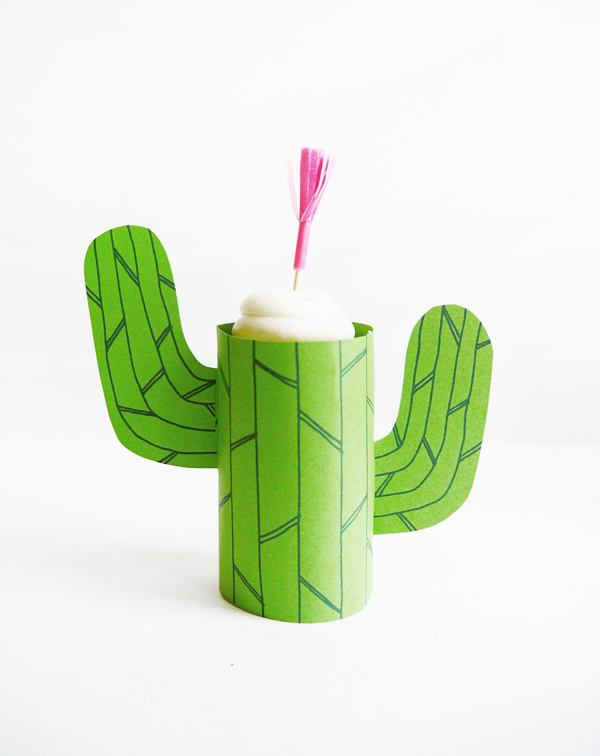 If you’re looking for any other cactus themed inspiration check here and here! 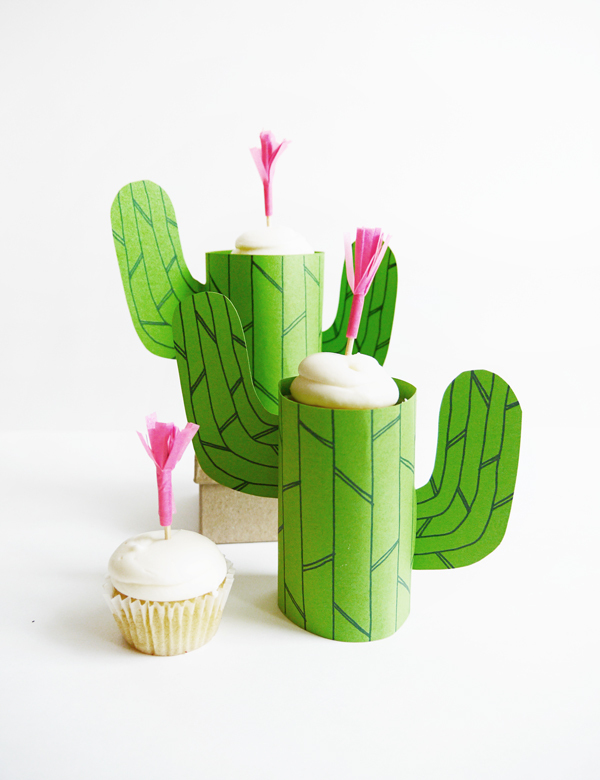 Materials: Printable Cactus mini cupcake stand, 8.5 x 11 green card stock, pink tissue paper, kraft knife, fringe scissors, regular scissors, double-sided tape, stapler, 1.5” circle punch, toothpicks. 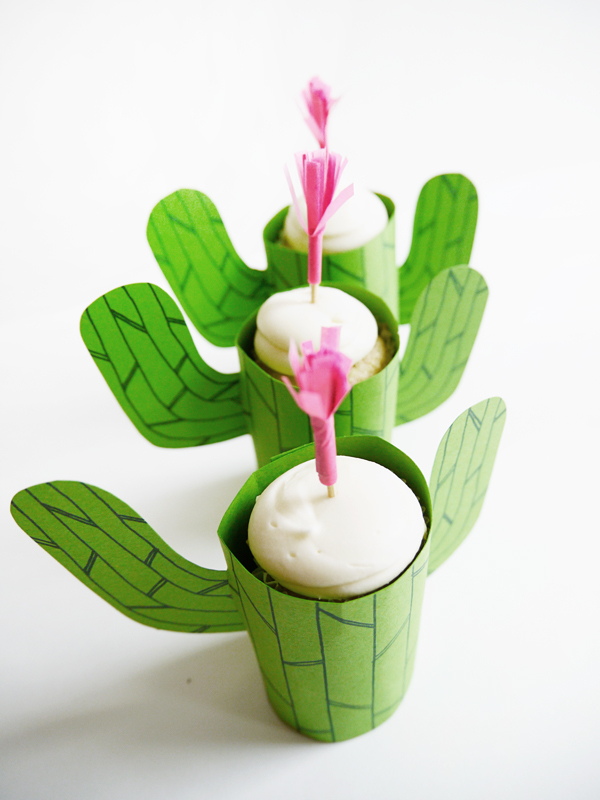 Step 1: Print out the Printable Cactus mini cupcake stand on 8.5 x 11 green card stock. 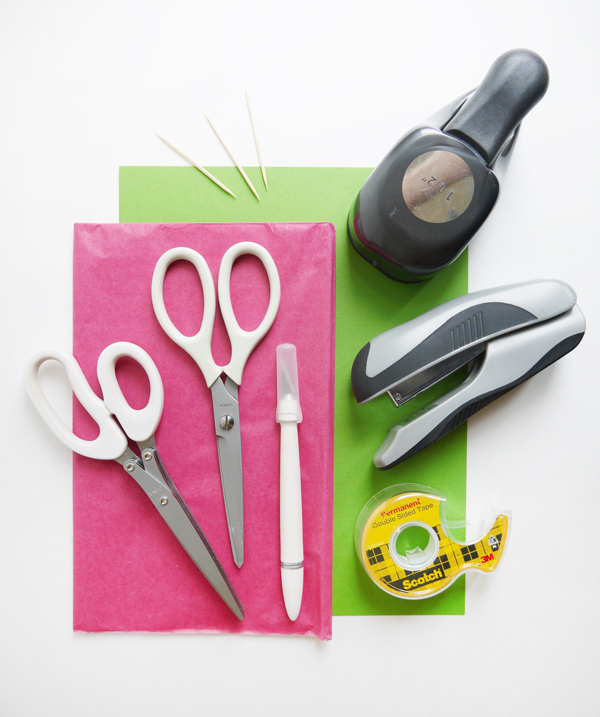 Use the 1.5” circle punch to cut out the circle piece. Step 2: With the craft knife, cut the indicated lines on the cactus body. This is where the cactus arms will go. Also cut the indicated lines on the interior cupcake stand. Make sure to fold down the top (indicated with doted lines) of the two stand pieces. Step 3: Assemble the stand by placing the two rectangular sections together and folding the tops down. Place a piece of 2-sided tape on the folded pieces and complete the stand by placing the previously cut 1.5” circle on top. Set aside. Step 4: Staple the cactus body together with 2 staples on the top and bottom. Make sure it is loose enough to fit over the cupcakes stand. Step 5: Insert the arms into the previously cut slots on the cactus body. Fold the part of the arms that is on the inside of the cactus body. This will make it easier to fit the stand in. Once they are snug to the insides, insert the stand. Step 6: Cut out a rectangular piece of tissue paper and fringe the long edge with the fringe scissors. Step 7: Apply a piece of 2-sided tape to the backside of the tissue paper and roll tightly around a toothpick. I ripped the piece of tape in 2 and used the one half of the piece at the top end and the other piece at that bottom. Step 8: Now that all of the pieces are complete, put a mini cupcake in the cactus stand and top off with the toothpick fringe flower! These are so cute! You always come up with the greatest things! Ok, this is adorable. Great job Alix!! This is a great idea,Alix, especially for a themed party!Thanks for sharing! There are not borders for your imagination! Great DIY! I`m in love!